Are you looking for ways to offer your energy and enthusiasm for experimental music while spending time with good people in a great setting? We often have volunteer opportunities such as mailroom and event support in Toronto. In return for your help, we'll welcome you into our enjoyable working environment in a one of Toronto's most creative buildings. 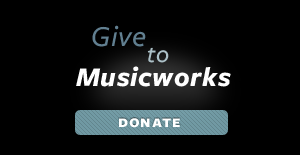 You'll be helping us continue our outreach in helping build new audiences for new music! For more information, e-mail our manager, or call us at (416) 977-3546. Encourage libraries to carry Musicworks magazine: In helping us make sure local public and university libraries carry Musicworks, you're helping us reach new readers in your area. Every new reader supports our ongoing growth! Call or visit libraries (public, private, and school) in your community. Let the librarian know you're interested in reading Musicworks at this library. Mention that Musicworks is available through the EBSCO Catalog of Periodicals for Public Libraries. If you can bear to part with it when you're finished, leave your copy of Musicworks in your local coffee shop, in a waiting room, or at the gym. You may be responsible for bringing us our next subscriber! We have great introductory subscription rates for your friends and family. Share something you value with someone you value!